Rectangular tablet with the badge of the Royal Navy at the top and the inscription in black lettering below. IN EVER LOVING MEMORY OF/ WILLIAM GEORGE CASBOLT. L'DG SEAMAN. 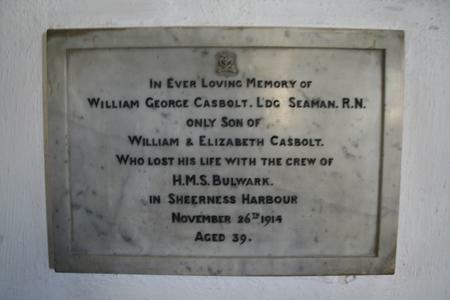 R.N./ ONLY SON OF/ WILLIAM & ELIZABETH CASBOLT./ WHO LOST HIS LIFE WITH THE CREW OF/ H.M.S. BULWARK./ IN SHEERNESS HARBOUR/ NOVEMBER 26th 1914/ AGED 39.